Dr. Masato Asai at the Graduate School of Medicine, Nagoya University, and his co-workers have identified MRAP2 obesity-suppressing gene, and their paper was published in Scienceon July 19, 2013. This research has globally attracted enormous attention and the researchers are expected to further progress their research in the field of obesity. The research group first monitored food intake of MRAP2knockout mice (KO mice) and wild-type mice. Under the condition that these mice were continuously allowed to consume food without restriction (which is called ad lib fed), KO mice had grown to weigh almost twice as much as age-matched wild-type mice at the age of five months. As shown in the picture, the two wild-type mice on the right scale pan together weighed lesser than one KO mouse on the left scale pan. The researchers then limited food intake of KO mice to what wild-type siblings actually ate the day before (pair fed). 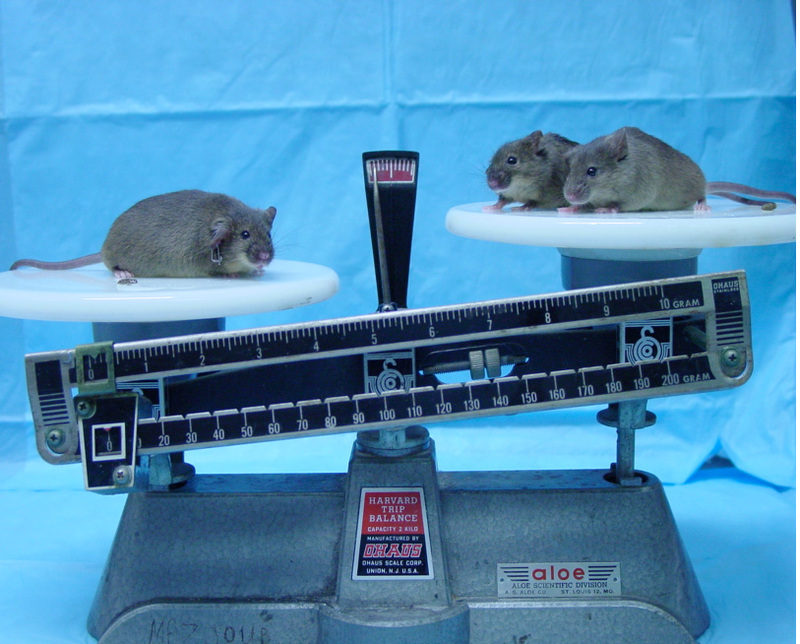 Consequentially, although they consumed a similar quantity of food, only KO mice gained weight. Thus, the researchers concluded that the gene MRAP2suppresses obesity irrespective of food intake. In addition, this research revealed that overeating and lack of exercise are not requisites for the development of obesity in mice. Additionally, this research indicated the involvement of human MRAP2 gene in human obesity by showing mutations of this gene specifically in obese human population. Therefore, elucidation of the detailed role of MRAP2 in the human body is widely anticipated. Dr. Masato Asai spent four years in conducting research at Children's Hospital Boston, Harvard University, where he generated the mice with MRAP2 mutation that was investigated in this study. He built an extensive network of contacts with world leaders in the medical sciences and gained new perspectives by interacting with people in the United States. Currently, he provides medical care as a physician at Aichi Sannomaru Hospital, and in parallel, conducts research at Nagoya University. He aims to maintain a spontaneous approach in the pursuit of his interests. "Hereafter, I will conduct research on a wide range of topics related to brain disease extending beyond the realm of obesity. I would like to keep an open mind and focus my research on what interests me at the moment." "Japanese students can be internationally competitive. Please break out of your shell and expose yourself to the various values and perspectives of other cultures. I recommend that you refer Jacques Lacan on the essence of humanity, and readSirens of Titan by Kurt Vonnegut Jr. I hope you realize early how empty the ideas like fame, money or career success. Let's live like mice with your instincts and olfactory sense!"